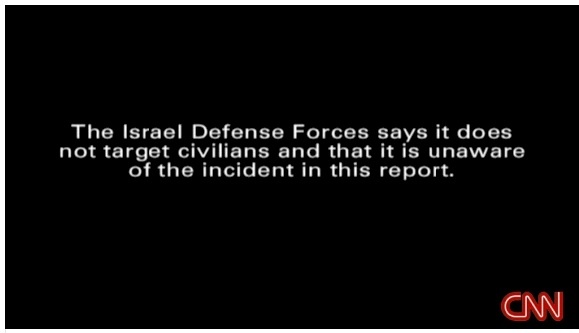 This post follows up on last night's NewsBusters post ("They Never Learn: CNN Withdraws Apparently Faked Video of CPR Attempt on 'Dead' Palestinian Child"). CNN has reposted a video it withdrew yesterday. That video purports to show the death and hasty burial of a cameraman's 12 year-old younger brother, one of two children allegedly killed on the roof of their home in rocket fire from an Israeli drone. Charles Johnson of Little Green Footballs, Ed Morrissey at Hot Air, Bob Owens of Confederate Yankee, and several NB commenters yesterday all questioned the credibility of the video. Johnson, Owens, and Morrissey still believe it was staged. There's no truth to accusations by bloggers that a Palestinian camera crew staged a video showing the death of the videographer's brother after an Israeli rocket attack, said the team's employer. "It's absolute nonsense," Paul Martin, co-owner of World News and Features, said of accusations leveled by bloggers at videographer Ashraf Mashharawi. "He's a man of enormous integrity and would never get involved with any sort of manipulation of images, let alone when the person dying is his own brother," Martin said. "I know the whole family. I know them very well. ... [Mashharawi] is upset and angry that anyone would think of him having done anything like this. ... This is ridiculous. He's independent." Raafat Hamdouna, administrative director at Shifa Hospital in Gaza City, said Friday that "Mahmoud Khalil Mashharawi, a 12-year-old, was brought to the hospital, and he was breathing, but he was hit in the head and all over his body by shrapnel. He died later in the hospital. He was treated by the Norwegian team. When he was brought in, he was breathing. The team did their best to save him. I am not really sure if they even tried to rush him to the surgery room, because he was badly hurt." ..... In a brief conversation with CNN, Mashharawi said that doctors tried everything they could to save his brother and that he rejected suggestions that any of his work was inauthentic. Before bloggers made their accusations, Mashharawi told CNN, "I believed at that moment if I didn't record that nobody will believe what's happened to my brother. Because it is unbelievable. Until now, I can't believe what's happened." If they really had “little hope” the patient could be saved, they’d be going all out with CPR, which means very vigorous chest compression (it’s not unusual to break ribs if it’s done right), and ventilation to oxygenate the blood—not delicately touching the boy’s abdomen with the tips of their fingers as we see in that video. It’s not only a fake, it’s an absurd fake. It’s not even done well, and Gilbert’s dramatic headshake at the end of the supposed CPR — in which Doctor #2’s hands keep coming off the body — is only the cheesy coup de grace. Why did CNN republish this? ..... Maybe Martin can explain how a missile hits a roof and kills two boys but does no more damage to the roof than what a pickaxe could do in five minutes — and how the furniture didn’t get disturbed. CNN has also yet to explain what kind of Israeli drone could have fired the purported missile, and what kind of missile would cause the minimal damage shown on the rooftop where it is claimed these boys are killed. Me? I'm just cynical enough to believe that CNN spent the past 24 hours making sure that there was no one on the inside in Gaza who could directly refute a claim that the video was legitimate. The cameraman isn't accused of "manipulating images." He and others are accused of staging the video.